Having problems tracking team projects? Never learned how to use a formal project management application? You might want to try Trello. 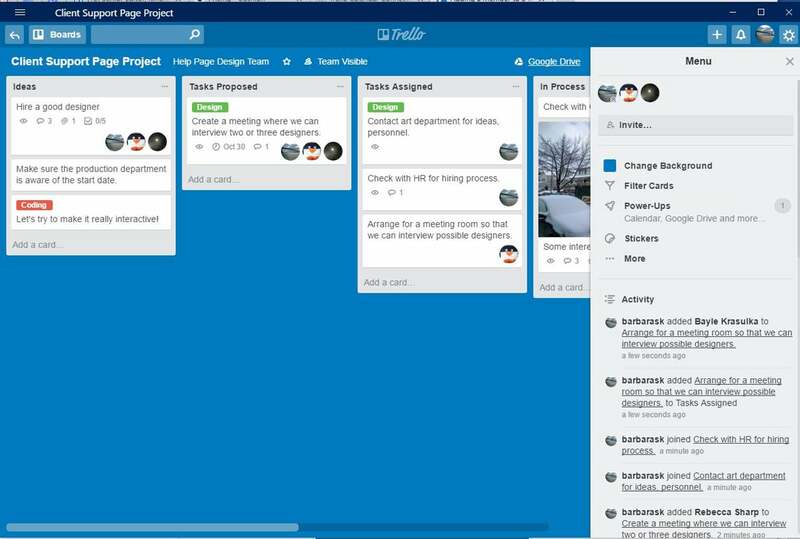 Atlassian's Trello can be described as a project-management tool for those of us who don't have the time or inclination to learn traditional project-management techniques. Rather than having to deal with Gantt charts, milestones and similar concepts, users can employ a visual system known as Kanban that allows them to track events, activities, tasks and more by dragging and dropping cards between a series of lists. Each series of lists is in turn contained within what Trello calls a board. So, for example, let's say you have new project where you have to implement a support page for your company website. You could create a board called Client Support Page Project. That board then could contain, say, lists titled Ideas, Tasks Proposed, Tasks Assigned, In Process and Completed. Within each list you then start adding cards — a card can contain notes, comments by (or full conversations among) various team members, links to websites, photos, or other useful information. And each card can then be moved from one list to another — for instance, a card in which you and your team discussed whom to hire as a designer can start in the Ideas list and then be moved to Tasks Assigned. Although it's very simple to start using Trello, as with all good applications, there are a number of tips and tricks that can make it even more efficient and useful. We've collected 10 for you to try.